This week on the ‘European Tour’ we head over to Qatar for the Qatar Masters which starts on Wednesday. Some excellent players are teeing it up this week including the defending champion Sergio Garcia who unsurprisingly is the favourite. The likes of Justin Rose, Charl Schwartzel and the highly regarded Alexander Levy also feature after performing reasonably well in Abu Dhabi last week. The Qatar Masters has seen some great players win over the years, Australian Adam Scott has won this event on two occasions, albeit a few years ago now. Henrik Stenson and fellow Swede Robert Karlsson have also won the Qatar Masters and I wouldn’t be surprised to see a big name win in the desert this week. Since the inception of the Qatar Masters in 1998 Doha Golf Club has hosted this event therefore we know what to expect from this relatively tricky golf course. At 7400 yards in length it’s certainly advantageous however it’s not essential as many of last year’s top ten proved. The course features many doglegs and water comes into play on six of the 18 holes and I’d argue that finding the fairways is also important, therefore the total driving statistic is something I’ve focused on when placing my bets this week. Alexander Levy – I made the young Frenchman slight value at 35/1 therefore I’m happy to back him to win this week. Over the past year Levy has proved too many including me that he’s and excellent player. During 2014 he finished 9th in the Race to Dubai and recorded two victories on the European Tour and I’m confident he’ll recorded his third at some point this year. Last week Levy finished 20th in the Abu Dhabi Championship however he should’ve finished 9th but he three putted from about three foot on the last hole. If the weather forecast is to be believed there will be little wind this week and that’ll certainly benefit the big hitters including Levy. Length off the tee has proved to be advantageous around this course and Alexander is one of the bigger hitters on the European Tour, last season he was ranked 14th in terms of driving distance. Ernie Els – I rarely back experienced players nowadays however Ernie should be shorter than 55/1 in my opinion. He’s a 28 time winner on the European Tour and four of those wins have come in the last five years therefore he certainly knows how to win a golf tournament. Last week in Abu Dhabi Els finished in 12th position after shooting a final round of 65. After the event he tweeted “10 birdies and bogey-free this weekend @ADGolfChamps Game feels good. Looking forward to taking that form to Qatar @EuropeanTour”. I think it’s also worth noting that Els finished 20th in the South African Open a couple of weeks ago however he made more birdies than eventual winner Andy Sullivan, this shows his game isn’t in bad shape. Oliver Fisher – My final selection of the week is 150/1 outsider Oliver Fisher. The Englishman is only 26 years old and he’s already won on the European Tour, although that victory was back in 2011. Since then he has struggled however last season was one of his best years on Tour as he recorded five top ten finishes. Last week in Abu Dhabi Fisher tied for 12th position and hit 76.4% of greens in regulation which shows his game is in pretty good shape. 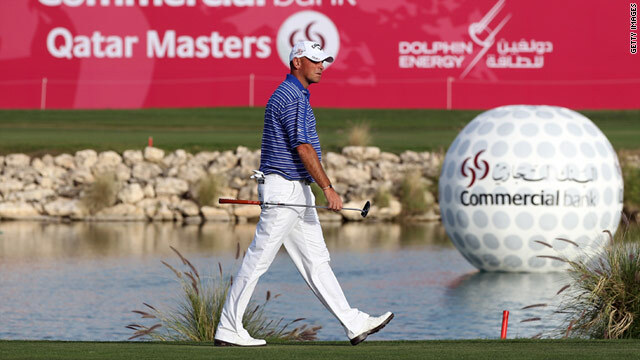 Admittedly Oliver has struggled around this track in recent years however he finished 11th here in 2007 and 25th in 2008 and his length off the tee should suit Doha Golf Club.